Lexicolatry: Breakfast - "It's What's for Dinner ... Er ... Lunch." Thanks for a fascinating post. It's never occurred to me before, but I suppose it's impossible not to eat breakfast, isn't it. Oh yeah! So when someone says "I normally skip breakfast," you can say: "Do you really? Do you?" with a look of condescending incredulity. Brilliant. Thanks! "Lunch" was originally a "thick slice" of something, of cheese or ham, say. Stateside, many people eat breakfast on the go, and very often in the form of "breakfast bars" or "meal replacement bars" (granola-y kind of stuff). In a way, we are still lunching for breakfast, if we consider these bars as lunches. I mean, they are thick slices of fiber and protein. So, for as much as we bemoan how far we have strayed from "the good old days," perhaps we are closer to them than we think. Just maybe the "good-old-I-had-to-work-the-fields-all-day" days. I never really understood why people in other countries always were so enthusiastic about breakfast for dinner. Do you know what we have for breakfast over here? Tea/coffee/milk and jam/nutella sandwiches. Or cereal. Nothing exciting about that when you shift it to dinnertime. It depends on what you eat for breakfast. A traditional American breakfast, if there still is such a thing, involves eggs, bacon, toast, etc. I suppose, though, that we might consider even this special in its history. Something reserved for Sunday. Now, it's Greek yogurt, meal bars, cereal, if anything. Or something purchased at a Starbucks. Go, go, go! 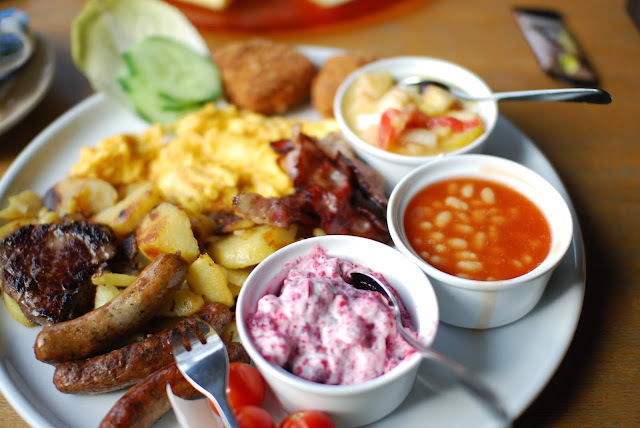 It's funny that in Britain they call a full fry (eggs, sausages, mushrooms, bacon, beans, toast and tea) a "Full English", whereas in Ireland they call it a "Full Irish". I'm pretty sure that the English came up with it first, but the Irish are loathed to have / eat / own anything with 'English' in the name. And there are a few differences - a Full Irish doesn't tend to have beans, for example, and always has black and white pudding. Regardless of what it's called, it's all yum to me, and I'd have it for breakfast, lunch and dinner any day of the week. Maybe it's more enjoyable then, because it's not as rushed? We call our main meal (the evening meal) supper, but in NZ, it was dinner. Since I've now read that I shouldn't say I don't usually have breakfast, I guess I'll have to refer to it as the morning meal! Is it just me, or does meal sound like a lot more food than a breakfast? I think the time taken for, the time attending to, breakfast for dinner definitely has something to do with it. Breakfast now seems to exist mainly as nutritional advice–something we should eating. I bet we all eat something, but way less than meal, as you point out. In my house, breakfast is breakfast, brunch comes between breakfast and lunch, lunch is lunch, dinner is dinner, and supper is a light meal before going to bed.